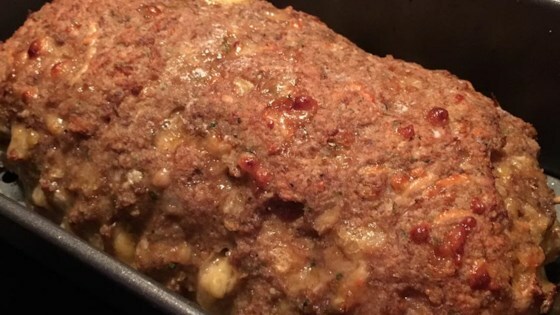 "A 'stuffed' meatloaf made with beef, pork, cheese, eggs, soup mix and bread crumbs. Mozzarella cheese jazzes up a classic." In a large bowl combine the beef, pork, soup mix, eggs, bread crumbs, pepper and water. Stir in 1/2 cup of the cheese. Mix well and spread half of mixture into a 9x5 inch loaf pan. Spread remaining 1 1/2 cups cheese over meat loaf mixture. Top with remaining half of meat loaf mixture. Bake in preheated oven for 60 minutes. Let cool 10 to 15 minutes before serving. This super simple meatloaf stars ground turkey and Colby cheese. Boyfriend's words, "Unbelievably good! Best meatloaf I've ever had!" We put three strips of bacon along the top, too. Mmmmmmmmm. Surprisingly good. Don't make more than you can eat though- not good reheated.